Worried about leftover chapattis? 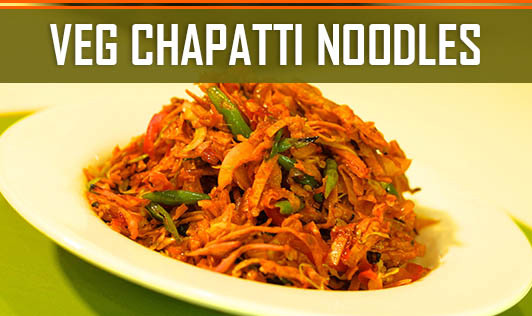 Try this interesting recipe made from leftover chapattis. Your kids will surely love this as an evening snack. • Stack 2 to 3 chapatis and cut them into 4 squares, using a sharp kitchen knife. • Cut each quarter in half and cut lengthwise again into thin strips. • Heat oil in wok or nonstick pan; add onion, garlic, and ginger until they turn golden brown. Now add the carrots and cabbage, and sauté them on high flame. Add the capsicum and spring onion and sauté for a minute. • Add the soy sauce, tomato ketchup, pepper powder, and mix well. Now add the chapatti strips and sauté for a minute. • Season with salt and cook another 5 minutes. • You can Indian-ize the recipe using sambhar powder and other traditional Indian spices. • You can also add egg/chicken/paneer to it. • Your chapattis and veggies should not be very soft. Add them only after the oil has reached its smoke point. This keeps them crunchy and only slightly soft.